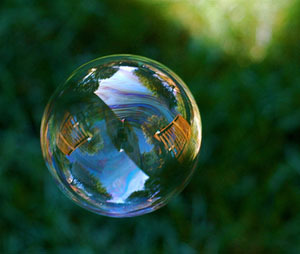 People are increasingly asking whether there is a Bubble underway in the tech business. The answer is that by the time you know there is a Bubble it’s probably too late to do anything about it. But if all you’re doing is asking whether there is a Bubble, the Bubble is probably not here, yet. Riding the Bubble is what VC’s do, so you should understand how it works a little bit too if you’re going to be involved with them. A VC has a portfolio, and only a certain number of the deals in the portfolio are going to be successful. The VC must maximize the value of the successful deals as much as possible. In the pre-Dot Com VC world, there was a lot more tendency for VC’s to help companies achieve a product market fit so they could take off. Multiple rounds of failure were pretty normal. Not so much any more. The multiple rounds of failure are there, but you’re expected to pay for them yourself and have considerable traction by the old standards before you see much capital. It used to be you could raise money for a slide show and a team. People who think that represented a bubble just haven’t been at it long enough to know that’s how things worked pre-dot com. Then, essentially as a reaction to the first dot com crash and its fallout, the bar has steadily risen. Immediately post dot com bust, you had to build the product and team, and you could get capital. This, BTW, was euphemized as being perfectly normal since all the new technologies made building a product so cheap. Funny, but it really isn’t that cheap for significant SaaS business software, only for B2C consumer Internet, but we digress. Not long after bootstrapping product became the norm, the bar was raised again so you had to find a few customers who loved the product and team, and you could get capital. Now you have prominent VC’s like Fred Wilson, who say they don’t think companies should spend a dime on marketing. ”Marketing is for companies who have sucky products.” That’s just a blunt way of saying that today, you have to build the team, create the product, get some customers, and create enough viral momentum that it appears you don’t even need marketing. Like I said, there’s not so much helping companies achieve product market fit going on any more. VC’s want to use their capital to pour gasoline on what is already a raging bonfire. This strategy can be extremely successful, as Sarah Lacy reports in her missive (via Techmeme) about whether Late-Stage investing is the new black. Dave McClure does a good job explaining the Spray and Pray strategy for early stage. If you’re going to get involved before you’ve seen enough traction that you know the company needs little marketing and has gone viral, you’ve got to invest in a lot of deals. The reason is we don’t know how to predict which companies will go viral with much certainty. Virality in a consumer Internet business is a matter of calling fashion trends, something nobody is very good at predicting until after it has already happened. I say “If you must continue to be Early Stage” because a lot of VC’s that used to do Early Stage and Seed don’t any more. They normally are reluctant to tell you that, BTW. Relationships get started in these early stages and they want the relationship so you’ll be back when you get to their stage. Also, what’s called “Seed” or “Series A” is not very comparable to what used to be called “Seed” or “Series A”, it’s actually later. Let’s face it, the VC’s that show up after the entrepreneurs have already built a raging success have a lot of selling to do (one reason they want the early meetings around early stage capital to keep the relationship intact). They have not built a relationship with the entrepreneurs and they haven’t huddled in the foxhole with them during the early days helping create a product market fit. To offset those shortcomings, they have to pony up a lot of capital at a significant valuation. Welcome to some of the crazy numbers we see from Groupon, Facebook, and all the rest. After you get done ponying up a zillion dollars in capital for a hot property at a ridiculous valuation, your next question is how to get back out again with a decent profit. Momentum investing is such a timing game, and momentum, as opposed to Growth investing, is what today’s VC’s are doing. The Old Style of VC, was much closer to a Warren Buffet growth investor. Some of the Angels are still playing that game, and we’ll see whether they succeed. But the name of the game for valuation is timing the Bubble properly. You have to sell as near the top as possible, because this thing may collapse if we miss this wave. A famous early example of missing the Bubble, ahead of its time, is the tale of PointCast. In January, 1997, News Corp offered $450M for the company, which was tiny but had a lot of buzz. By March, the offer was withdrawn and PointCast’s fortunes declined steadily from there. I remember the application well because I was raising money at the time and every VC I visited had it running on a PC in the corner of their waiting room. It was all the rage in the write ups too. I remember not being able to figure out what the attraction was. After all, here is an app that was essentially a screen saver that showed news and advertising when activated. So, it would only present valuable content and monetizable ads when it was sure you weren’t using the computer any longer? Something was wrong with that picture, but then, I’m not an arbiter of B2C Internet Fashion. The bubbles are like sets of waves arriving at the beach. There’s hide tides and low tides and big sets and little sets. But there is always another wave. A lot of factors are involved. High and low tide may be regarded as frothy or depressed stock markets. The analogy to big sets versus little sets may be whether the competitive landscape is properly configured to cause a merger and acquisition frenzy. The latter are not as exciting as high tide, because there aren’t as many dollars involved in private M&A. It is, after all, fueled by some public company acquiring a private company. Decorum must be observed with one’s shareholders and everything is easier if our public stock is riding high. Now the ideal Mutha-of-all-Bubble-Windows happens when we not only have frothy public markets, but we also have strategic M&A going on like crazy. Strategic M&A is not about entering new markets. It’s about struggling to maintain advantage against a competitor that is scaring the heck out of you. It’s about there not being enough time to do it organically or by building it internally. It’s about not being able to hire all the talent you want and need. It’s about running a once great franchise that’s getting tired alongside all the shiny new franchises springing up during a major paradigm change. Dig it? When your job is to pour gas on a fire that’s already burning, you have to plan it carefully. Maybe the fire needs to spread on its own until there is enough combustible material nearby before you add the gasoline. Maybe you’re worried that the Big Bubble is going to come and go in the next 24 months and you had better pour gasoline on now so you’re big enough it matters. People wonder how Color got so much capital, so fast. The answer is not that the Bubble is here. Color is too early to catch a wave that’s here. It’s that the VC’s involved think the Bubble will have come and gone in 24 months or so and they want to make sure any deals they do now have enough gasoline to participate. The corollary for deals that don’t have what it takes to be in this bubble cycle is not that you won’t receive capital, but that the VC’s may some day soon be thinking its time to use the gas very sparingly. They’ll want into your deal so they can be ready for the next bubble, but they will be frugal. Hitting the brakes will generally kill the deal. You can’t pour the gas on, miss the window, and then go, “Hey guys, lets go back to our happy little bonfire, hunker down, and wait for the next wave.” It’s too late. You’ve hired like crazy, blown through capital like crazy, and every boy and his dog in the company has already test driven their new Ferraris and mentally become part of the landed gentry. Hunkering down will be massive culture shock and will feel like failure. Worse, the peeps you hire in the pouring-on-gas phase are not really entrepreneurs. They aren’t doing it for the love of it, they’re chasing the new hotness, and they will move on if they doubt your short-term future. For a whole lot of reasons, the US has systematically made it dramatically harder for companies to go public. It has done so in a wide variety of ways, so many that it sometimes seems to be a result of the Law of Unintended Consequences that it is so hard to go public. Sarbanes Oxley alone costs circa $6M to gear up for just before you go public and $3M or so each year thereafter. Companies used to go public on maybe $40 or $50M in annual revenue. SOX alone makes that difficult if the public market climate requires you to be profitable to go public. So, maybe you have to be able to grow to $80 or even $100M. If profitability is particularly elusive, you may have to wait for the right climate to go public as well. Once you get public, life is not a bowl of cherries either. If you have the sort of company that is Riding the Bubble, because it is more of a Fashion statement than an ROI statement, this is a problem. Each extra year of growth needed to reach the public company initiation standard adds risk that your Bubble will burst before you can ride it to the finish line. If President Obama wanted to fix the recession rapidly, he would figure out how to make it possible (forget easy) for a $50M revenue company to IPO. I favor making regulations like SOX only applicable to companies with $1B or more in revenue. Heck, let’s be generous and call it $500M or more. Figure out how to get the analysts back in play too. We were so afraid of skulduggery there that we’ve created a situation where there is almost no information available. First, the VC’s didn’t sign on to build something. They have to make a return for their investors. If you got good VC’s, they will be very good at this. Regardless of whether they’re good or not, this is what they do and they will not let much get in the way of it. You’re going to have to deal with it, support it, and learn how to succeed with it. If you’re really good and the sort of entrepreneur who can grow with the company, you will figure out how to be a star at helping the VC’s do what they need to do. That will give you the opportunity to build a lot more things down the line. Second, have a realistic view of what you have built. This is the hardest thing to get on the same page with your VC’s about. Sometimes they’ll be wildly over enthusiastic, and maybe that’s what happened to Pointcast. Sometimes you’ll be wildly over enthusiastic and they’re ready to cash out. Never forget that companies are not sold, they are bought. They’re not very liquid. You can’t necessarily chose when you’re ready to cash out. When opportunity knocks, give it careful consideration. The next wave is a ways out, and every year is risk. Back to the Future: Are We in Another Tech Bubble? It’s about to get a little crazy out there . . .